Create a classic bathroom statement with the traditional 3 outlet shower package, brings substantial elegance to the bathroom. The triple valve enables you to select body jets, fixed shower head or handset for a quick freshen up or for a real drenching. Suitable for all types of plumbing installation this shower valve has the added safety benefit of a built in anti scald device should the cold water supply fail. Separate controls for temperature and flow. 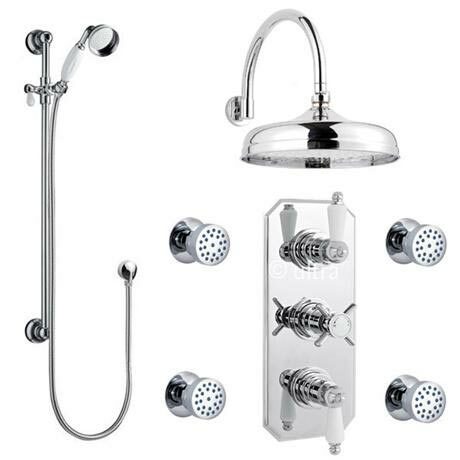 Operates two shower accessories separately or simultaneously and diverts to a third option: fixed head & slide rail kit, fixed head & body jets or slide rail kit & body jets with option to divert to a third option. A perfect solution for today's bathroom, providing style and functionality.